Radiating vibrant, sunset hues, this lavish bouquet of boldly velvety roses will fill any room with vivid color, natural beauty and sweet floral scents. 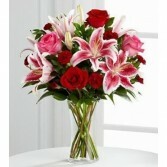 Cheerfully elegant, this arrangement is an ideal token of your affectionate birthday wishes! 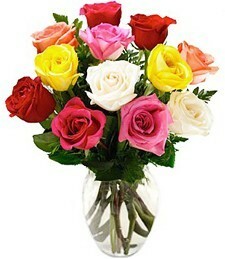 This Darling Bouquet bursts with brilliant color and an elegant fragrance to win their heart! 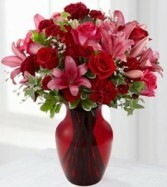 This splendid arrangement of rich red roses, fuchsia roses, eye-catching Stargazer Lilies, burgundy mini carnations and lush greens will make their holiday blossom with love and romance. 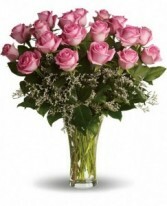 Arriving in a slender clear glass vase, this bouquet creates a sophisticated gift of unmatched beauty to express your love and affection bouquet. The Blooming Romance Valentine's Day Bouquet displays deep blushing hues to send your most romantic intentions across the miles! Rich red roses, bi-colored pink roses, dark pink Asiatic Lilies, burgundy mini carnations and burgundy carnations are gorgeously accented with white limonium and lush greens to create an incredible Valentine's flower arrangement. Presented with a ruby ginger jar glass vase, this flower bouquet will make this February 14th a day your sweetheart will always hold dear.